As every SoCal surfer well knows, August was sorely lacking in swell. 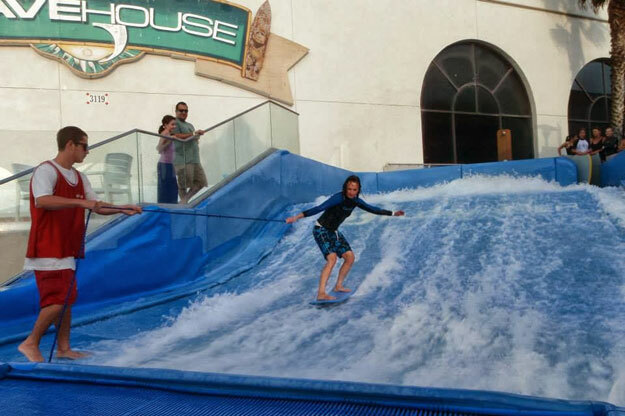 As weeks of near flatness continued on, a few friends and I decided to try the artificial waves at the Wavehouse in San Diego. The park has two wave simulators, the FlowRider and the FlowBarrel. An hour of time on the Rider is required before anyone can progress to the Barrel. With water already rushing up the FlowRider’s slope, the operator ran quickly through a few instructions on how to ride. When my turn came, he set the snowboard-like flowboard along the edge of the fast-running stream and put his foot on the front to steady it while handing me the other end of a rope. I placed my feet on the board and tried to shimmy it out into the flow. Bam! The board was lost and and I was down, pushed up the slope by the mad rush of water, across a hard grate, slamming to a stop against the padded back wall. I picked myself up, wiped the chlorinated water from my eyes, and got back in line. With 15 people on the ride each hour, about evenly split between bodyboarders and stand-up flowriders, the waits could be long. The trickiest part for me was easing the board from the side out into the flowing water, and in attempting that, I fell many times. When my board fortuitously washed up nearby, the operator let me try again twice until I managed that semi-successful ride, but the other falls ended my turn. If the lost board got pushed up the slope to the back of the ride, I was to fetch it – which seemed a sketchy maneuver when there was a rider below, if she’d happen to fall and come hurtling toward me. The two operators, who worked alone sequentially, appeared focused on what seemed to be their main duty: indicating to the lines of bodyboarders and flowboarders who was up next. The water was promptly shut off when the hour was up. I’d tried a bodyboard once and a flowboard 4-5 times, standing up in the flow only once for maybe 10 seconds. The FlowBarrel did look fun, and a whole lot more like surfing, especially with the experts riding. But the newbies experienced some bad wipeouts, getting sucked up the barrel and thrown down by the pitching lip, then washing fast into a corner of the ride. “It hurts more when you fall than the FlowRider,” a compatriot from the earlier session told me. One of my friends who tried it left with a couple of cuts and bruised knees and elbows. Still, it ain’t the ocean (which poses dangers of its own), and clearly there’s good reason for the small print in the waiver all riders must sign. The FlowRider and FlowBarrel have been blamed for injuries including broken ankles, shoulder dislocation and rotator cuff tear, a bruised spinal cord, dislocated vertebrae, and possibly even a death. In the hot tub, I examined the bruised side of my foot, which I knew I’d scraped on the FlowRider’s grate when I was pushed over it after a fall. Only when I got home did other parts of my body start to make their injuries known: a sore neck, bruised ribs and thigh, a scraped knee, and worst of all, a painful shoulder joint. It was that last that kept me awake much of the night, despite ibuprofen, and worse, prevented me from surfing the next day. Setting aside an unfortunate kook wipeout that resulted in a back injury, the after-effects of flowriding were worse than any beating the actual ocean has dished out to me. Yet I counted myself lucky. I’ll stick to real waves from now on, thank you.